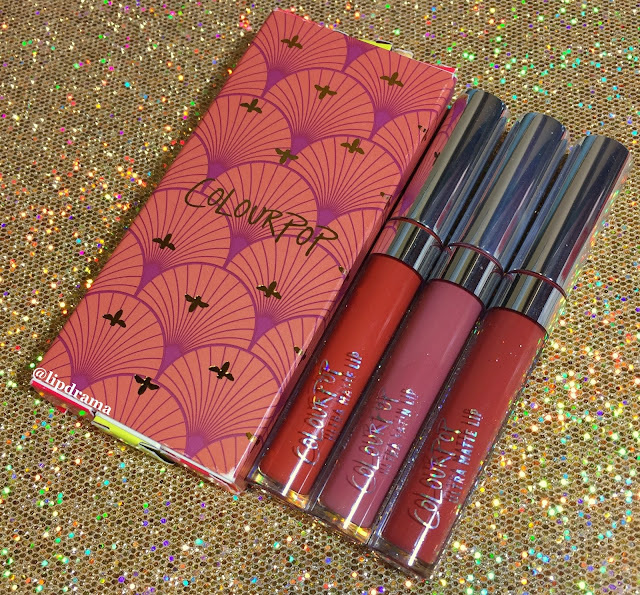 ColurPop had a free shipping promo not too long ago and I took advantage of that along with the discounted price of these new Fall lip bundles. These three shades retail for $18 but the bundle costs $15 so you save $3. It's like getting one shade for 50% off. I decided to pick up the Up & Away set, which features terracotta shades. I love an orange lip and these have just the right balance so that they look great on everyone. The Up & Away bundle features two Ultra Matte shades, Mama and Love Bug, as well as one Ultra Satin, Calypso. I love the mix of shades in this bundle but I was a little worried about Love Bug. It was one of the shades that was given free during a previous promo and it didn't get rave reviews. While everyone seemed to love the color they complained that it was unusually dry and flaked very easily. Pretty much it sounds like complaints heard from everyone (myself included) when ColourPop first launched their liquid lipsticks. They have since reformulated their products and their liquid lipsticks have gotten much better. Still dry but they don't usually flake. Sadly, I must say that ColourPop has apparently not listened to the cries from their customers who would love to see this gorgeous shade reformulated. 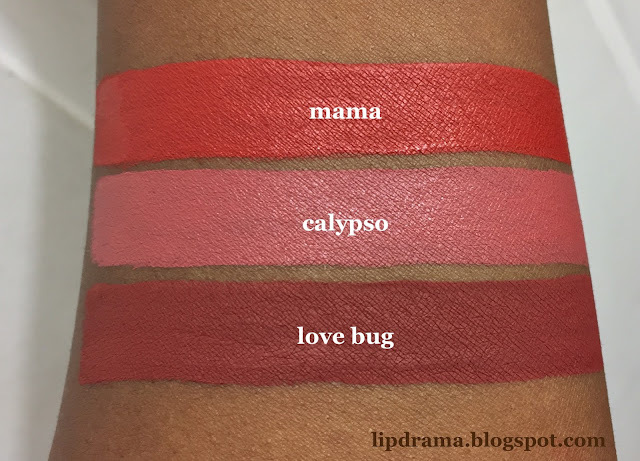 As you can see from this swatch it is much drier than Mama, which is also an Ultra Matte. I suggest working fast as it dries very quickly and try only applying one layer. When I applied more it started to crumble. Also moisturize your lips well before hand and blot it off as too much can interfere with the formula and it may not dry matte. Purchase this set or the others bundled or individually here.